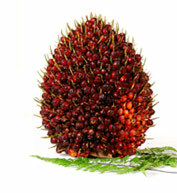 Fresh Fruit Bunch (FFB) refers to the bunch harvested from the oil palm trees. Each bunch weighs 5kg – 50kg and may contain 1500 or more individual fruits. Calculations of oil yield and losses in the oil mill is linked to the quality of the fresh fruit bunches, as this is the material taken in for processing. The FFBs are harvested periodically and then transported to the processing mills to be processed into crude palm oil (CPO) and palm kernels. All byproducts are either consumed or recycled.